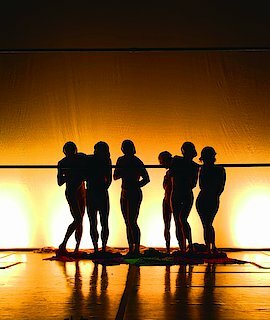 Prisms, a colourful choreographic extravagance by Benoît Lachambre, looks into the presence and radiance of bodies. Abounding in humour and inventiveness, Prisms plays on our perceptions by means of distorting lights, sounds and bodies – an experience intensified by Lucie Bazzo's ingenious stage lighting. Dazzling as the spectacle is, it invites us to question the truthfulness of visual appearances.